Vrindavan, on the Yamuna river, is an important pilgrimage centre. 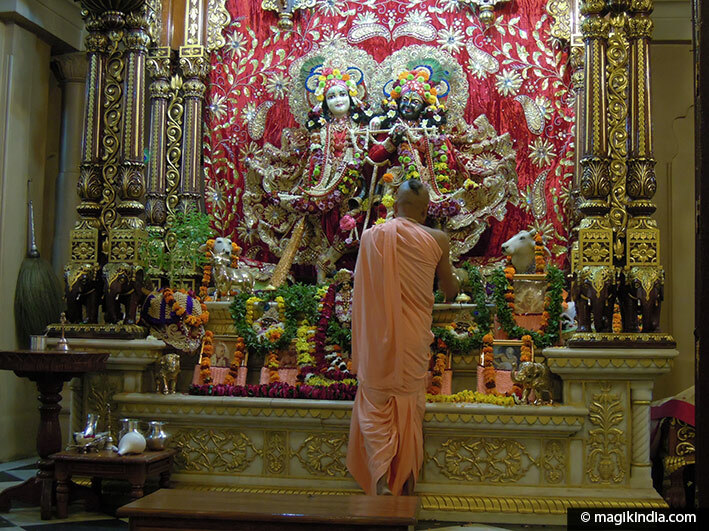 Over 500,000 Hindu worshippers come to Vrindavan each year. They come to bathe in the atmosphere of the place and dance to the rhythm of the dark-faced Lord Krishna. It is said he spent part of his childhood here. 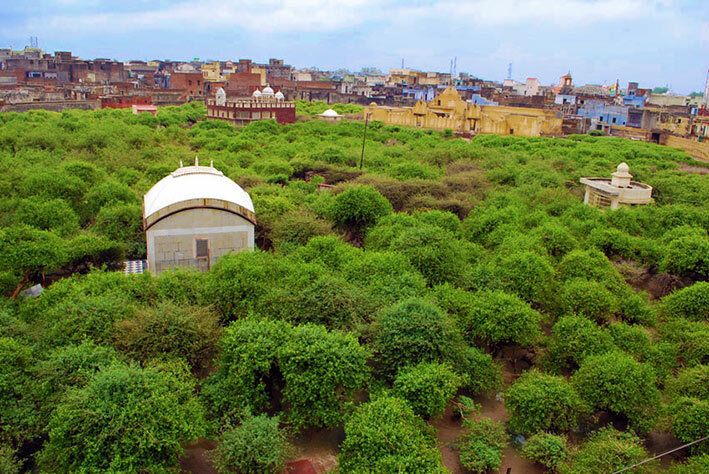 The name Vrindavan comes from brinda, a name for the tulsi or holy basil bush, and vana, meaning “forest”. The whole area is said to have been tulsi forest at one time. In many temples dedicated to Lord Krishna, it is not unusual to see worshippers performing special dances. This practice is closely tied to Lord Krishna story. Rasa Lila, which could be translated as “dance of divine love”, is a devotional dance that Krishna and the gopis (milkmaids) performed. One night the gopis of Vrindavan crept from their homes and went into the forest, drawn by the sweet sound of Krishna’s flute. Lord Krishna danced the Rasa Lila with the gopis for a whole “Brahma night” (which Hindus consider lasts about 4.32 billion years). 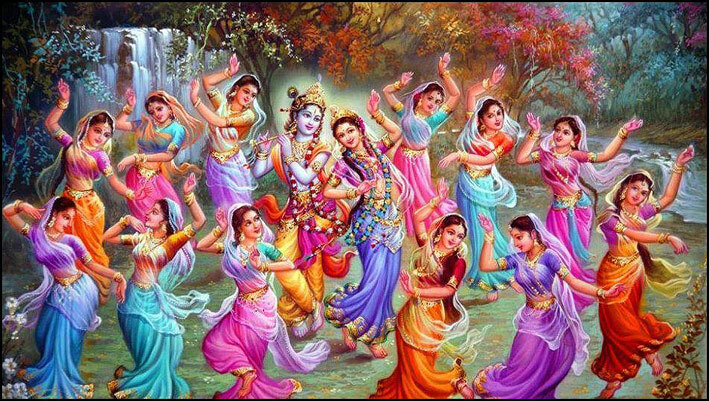 Dancing like this with Lord Krishna filled the gopis with pride and they felt they were above other women. To teach them humility, Lord Krishna disappeared during another Rasa Lila. When the gopis could not find him they were greatly saddened and began to sing and pray for him to come back. Krishna came back, smiling, when he saw the gopis were cured of their vanity. He then blessed them with a Maha Rasa (a great sacred dance). 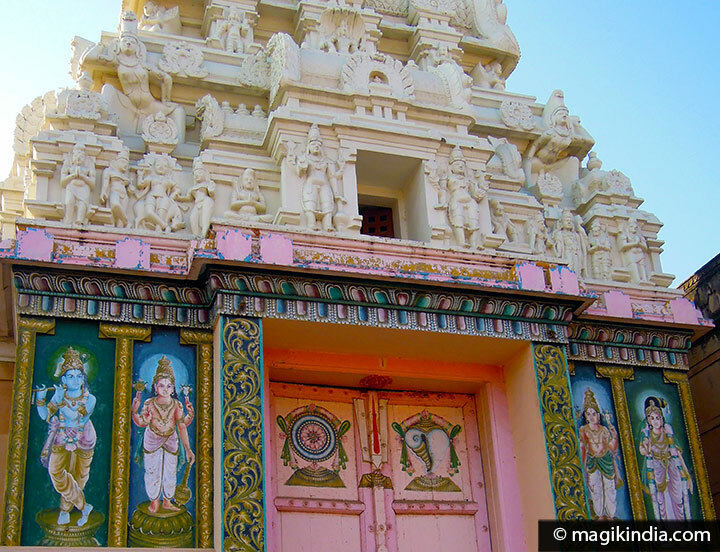 Banke Bihari temple is in the Raman Reti district, built in 1864, is one of the most sacred. 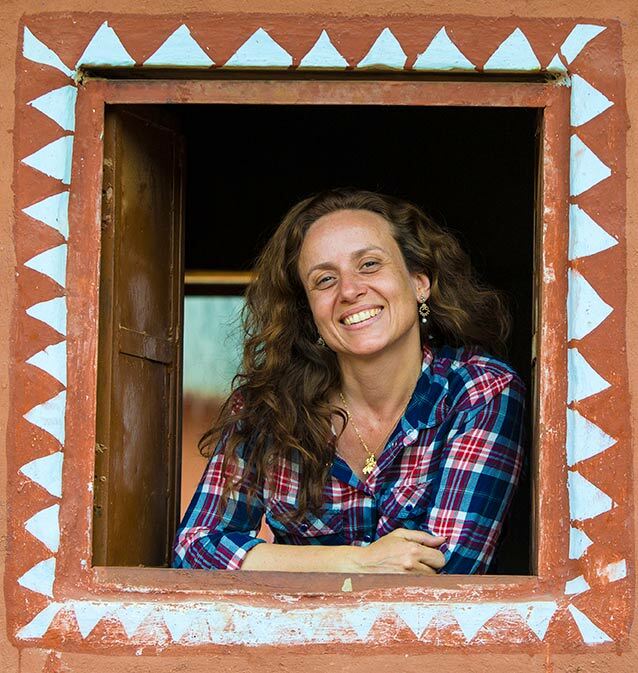 Banke means ‘bent in three places”, referring to the tribhanga or S-curved posture of Indian classical dance, and bihari means “one who brings supreme joy”. This temple is the only one of its kind. The idol, Krishna, is represented as a child. There is no mangal arati (offering of flames) and bells and conches are forbidden so as not to disturb the god. There is only recitation of the mantra “Radha Naam”. A curtain is drawn in front of the idol once every minute; the statue is said to have such power that anyone who looks at it for too long will faint. The ambience of mystery in the temple and the fervour of the devotees is an experience not to be missed. 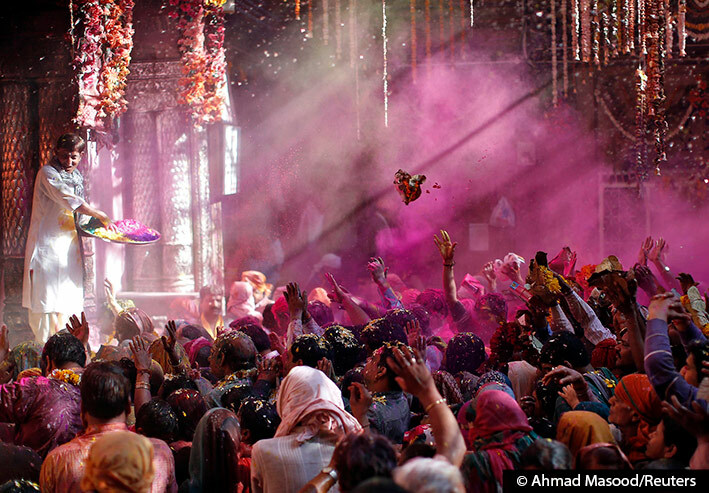 The temple is especially impressive during Holi, the festival of colours. Madan Mohan, built by Kapur Ram Das, stands on a hill near Kali Ghat. 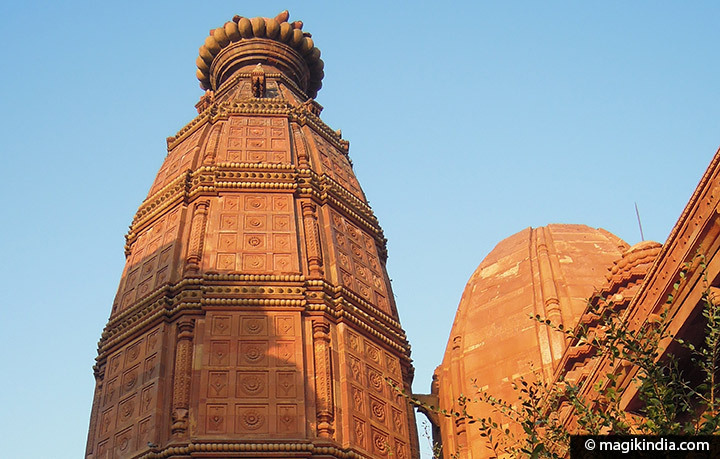 It is the oldest temple of Vrindavan. It is associated with the saint Chaitanya Mahaprabhu. The statue of Madan Gopal (Krishna) venerated in the temple today is a replica of the original one, which was moved to Karauli in Rajasthan to protect it during the reign of the Mughal emperor Aurangzeb. Sri Ranganatha is dedicated to Vishnu in his Sheshashayi posture (lying on Shesha Naga, the divine serpent). 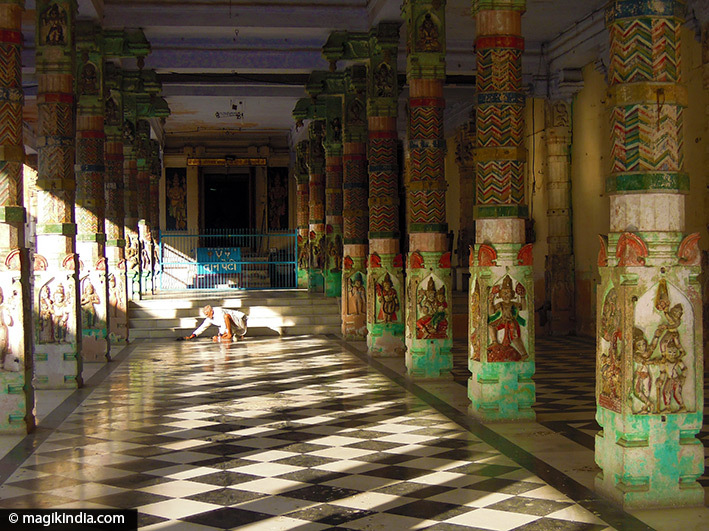 Nidhivan in the town centre is certainly one of the most mysterious places in Vrindavan. There are many myths about this forest of tulsi bushes where hordes of monkeys have made their home. 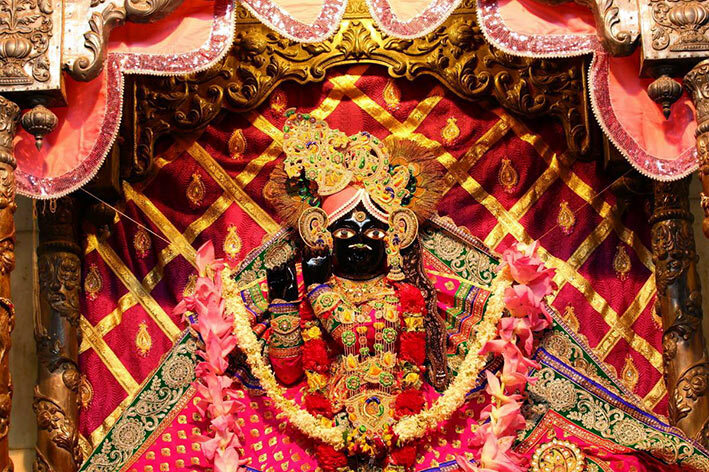 It is said that Radha and Krishna come each night to dance with the gopis, who turn into bushes in the daytime. The bushes bend their branches low, showing their respect for the divine couple. 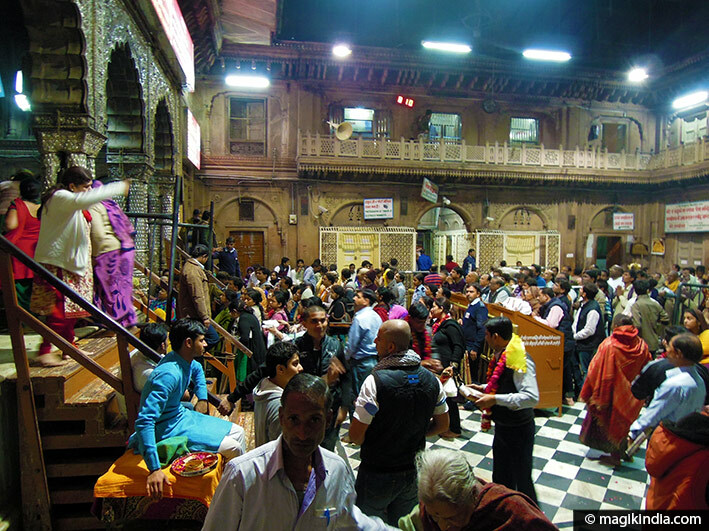 It is said that no one can stay inside the temple precinct after arati, the flame offering at 8pm, for fear of becoming blind, deaf and dumb or worse. No one must witness the dance of Radha and Krishna. 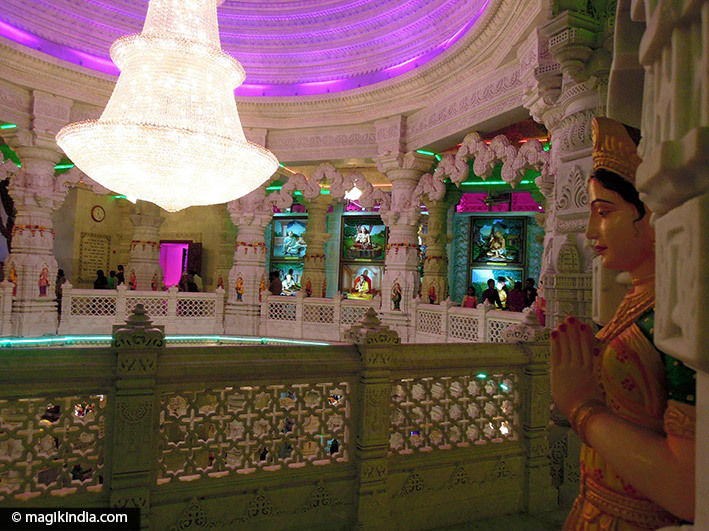 Prem Mandir is the largest temple in Vrindavan (22 hectares), the most recent (2012) and surely the most costly. 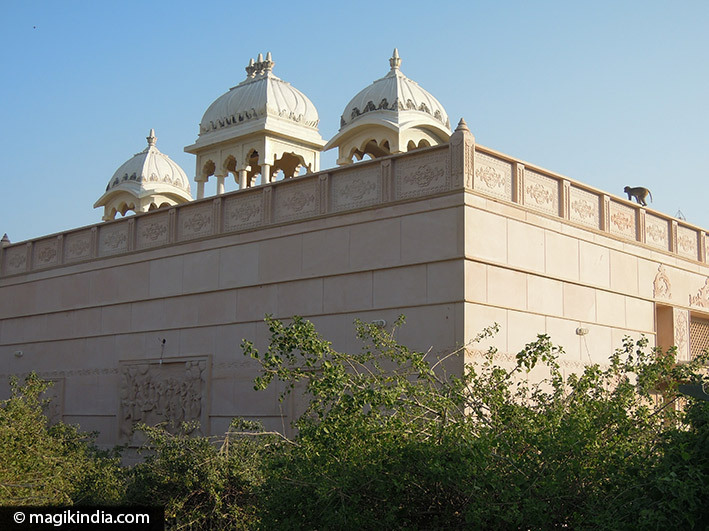 It was built of white Italian marble by Jagadguru Sri Kripaluji, and is also an educational complex telling the story of Krishna. The temple is a symbol of prem: divine love. It is especially interesting in the evening when it is lit up, the light changing colour once a minute. At 7pm the musical fountains start up. 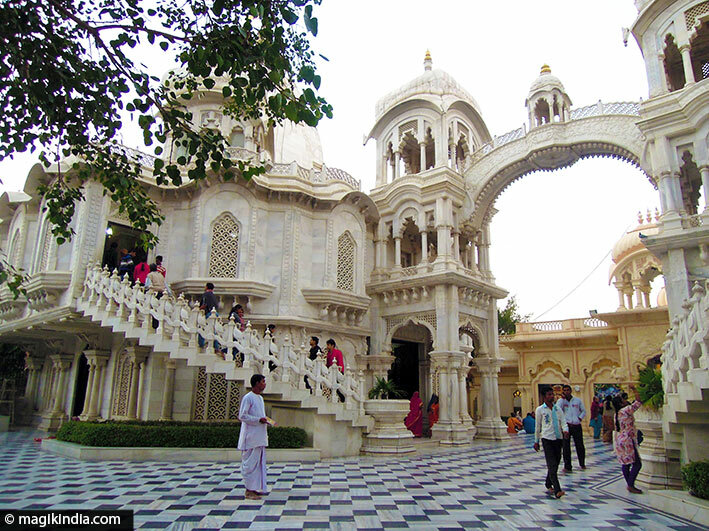 Krishna Balaram Mandir is a temple of the International Society for Krishna Consciousness or ISKCON, better known as the Hare Krishna movement, whose founder and spiritual master was Bhaktivedanta Swami Prabhupad. The temple was built in 1975. Its main deities are Krishna and Balarama. Its kirtans (devotional songs) are particularly lovely and entrancing and are sung round the clock. The founder’s white marble mausoleum stands at the entrance. Sri Gopesvara Mahadeva, one of the Vrindavan’s oldest temple, is dedicated to Shiva. It is said that Shiva came to Vrindavan to become one of Krishna’s gopis. When he had taken the form of a young milkmaid and bathed in the holy waters of the Yamuna, Radha blessed him by allowing him to join in Krishna’s Rasa Lila or divine dance. 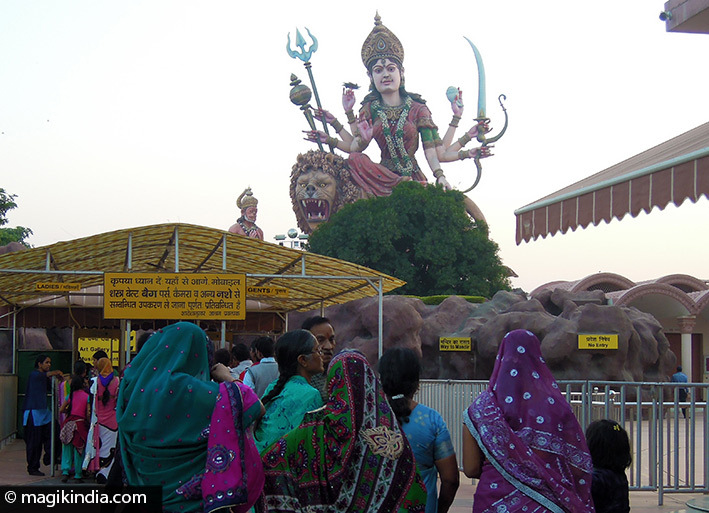 The name Gopeswar for Shiva comes from there – a contraction of Maheshwar (Shiva) and gopi. 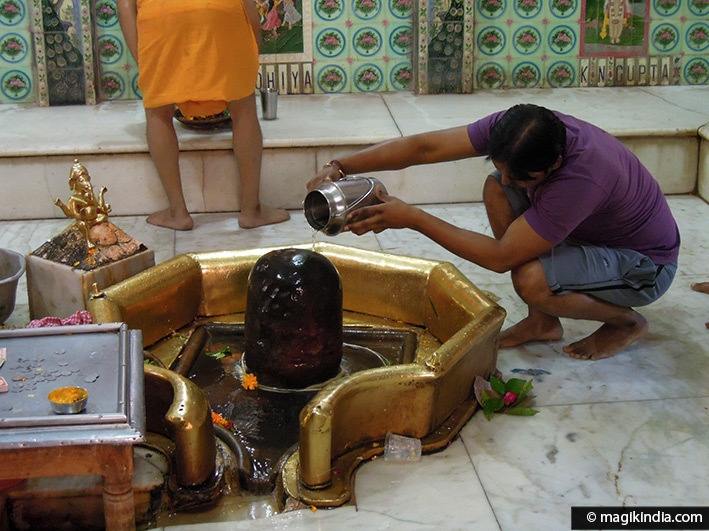 The Shiva lingam in the temple is said to have been placed there by Krishna’s grandson Vajranabha. Worshippers pour water from the Yamuna over this lingam. The architecture of Govind Dev Temple is unique, quite different from the classic model. 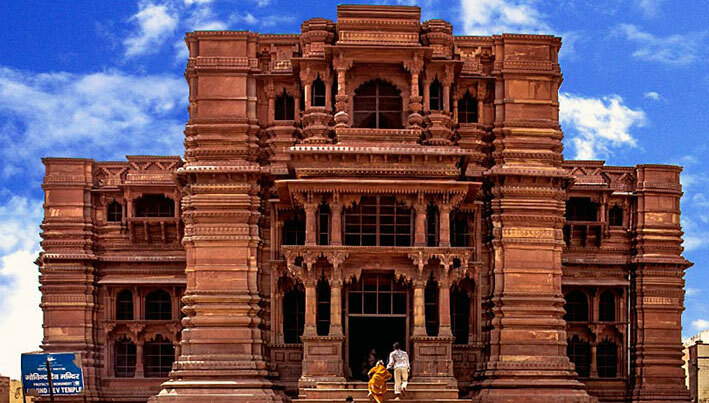 Raja Man Singh, ruler of Jaipur, had this red sandstone temple built in 1590, on the plan of a Greek cross. It was built on a raised foundation with a flight of steps up to the main hall. It was largely destroyed in 1670, during the reign of the Mughal ruler Aurangzeb, so that today only three of the original seven storeys survive. The temple is dedicated to Krishna. The original statues were moved to Jaipur to save them from being pillaged by Aurangzeb’s army, but their replicas are no less revered than the originals. 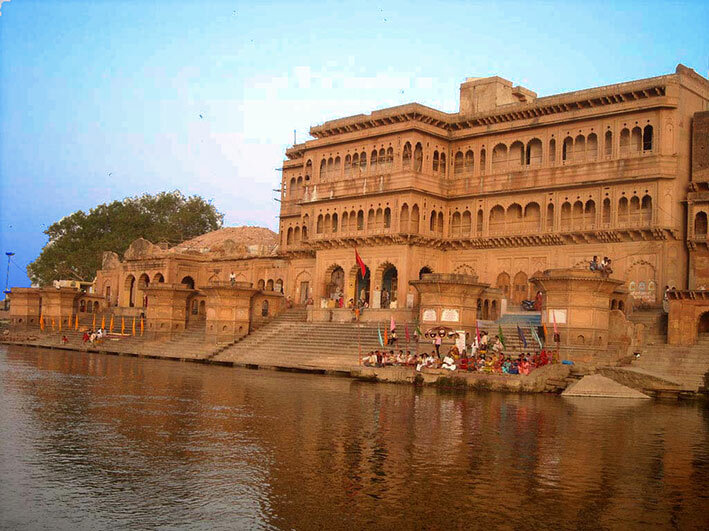 Vrindavan’s main bathing place is Keshi ghat*, where the steps rise majestically from the Yamuna to the palatial buildings behind. 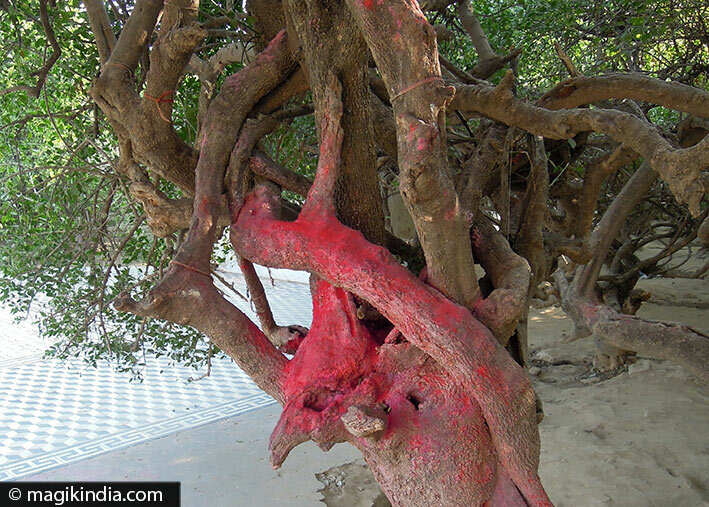 It is said to be the place where Lord Krishna killed the demon horse Keshi sent by King Kamsa. The ghat is at its finest in the light of the setting sun, just before the arti flame offering. 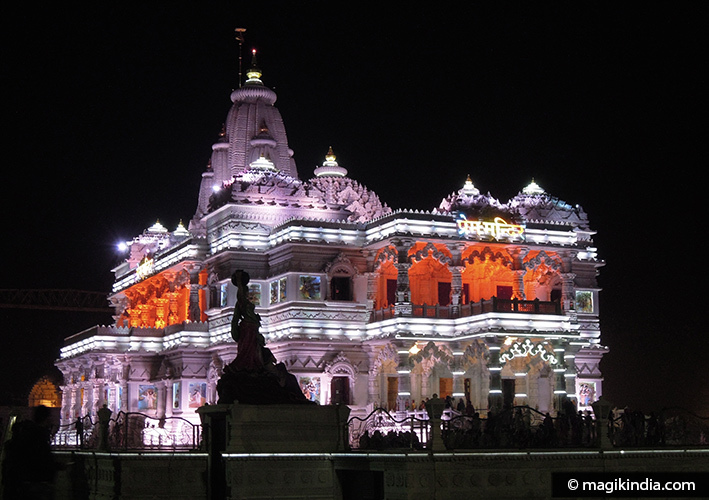 On the way into Vrindavan you’ll see a recent temple in honour of the goddess Durga.